When will I fully adjust to having a sitter for Kate? It’s Wednesday morning. It’s one of three days a week that a sitter comes to the house to stay with Kate. She’ll be here four hours. During that time, I will go to the Y followed by meeting my friend Mark for coffee. That will leave me with another thirty to forty minutes to run errands. I know and read about caregivers who would love to have this kind of freedom. It means a lot to me as well. I only engaged a sitter when I no longer felt comfortable leaving Kate alone. If I didn’t have a sitter, I would be much more restricted. Best of all is the fact that Kate has accepted a sitter and seems to enjoy having someone with her while I am gone. So why is it that I still don’t feel completely comfortable? I find this discomfort hard to describe, and I’m not going to attempt an explanation for it. At the moment, it is only something I want to acknowledge. It begins in the morning of the days we have a sitter. For example, it is now a little after 8:30. Kate is still sleeping. I don’t know how long she will sleep. I do know that I am going to leave her for four hours starting at 1:00 p.m. The longer she sleeps the less time we will have together today. I also know that when I tell her that I am going to the Y or to Rotary or a meeting, she often responds with, “What am I going to do?” At that moment, I have a tinge of guilt about leaving her. I am typically rescued from this burden quickly because I never tell her I am leaving until right before or at the time the sitter arrives. That leads me to say something like, “Well, you and Mary (or Anita, the other sitter) can stay here or you can go someplace like Panera.” When the word “Panera” comes out of my mouth, she jumps on that right away even if we have just returned from there. By the way, that happens frequently on Mondays when I take her there (or remain there) for lunch. On a couple of occasions the sitter has arrived early before we are home. This past Monday Kate didn’t even come in the house. She just got out of my car and into the sitter’s car for the trip back to Panera. Another pattern has developed in connection with having a sitter. As soon as the sitter leaves, Kate gets her iPad and sometimes her cup and comes to me in the kitchen. If she says anything at all, it is, “I’m ready.” That means she assumes we are going back to Panera or to Barnes & Noble. Then I get my computer and/or iPad and a cup, and we are off again. The afternoon visit is a short one because we usually go to dinner between 5:45 and 6:00. As you can tell, the sitter is working out well for Kate and for me too. I wonder if some of my discomfort is not wanting to hand over any of her care to someone else. That makes me think of my dad. He cared for my mom without in-home care except for a short trial that my brother and I pushed him into. I know there were other factors, but financial considerations were among them. Now that I am walking this same road, I suspect part of his unwillingness to accept help was his desire to do it himself. He might have thought no one else could do it with the same sense of compassion and joy. I can identify with that. Today has been a good one for social engagement. Angie and Tom Robinson were in town for lunch and a pleasant afternoon of conversation. We had lunch at Carla’s. They had liked it year or two ago when we had first taken them there. I am glad we went. It offered them a glimpse of why I say that eating out is a social occasion for us. We go to Carla’s frequently and know several of the restaurant staff. One of those is the manager, who stopped by our table to say hello. She ended up giving us complementary desserts. As we were about to leave, the newly retired CEO of United Way took a table next to us. We introduced him to the Robinsons, and we spoke briefly before leaving. After that we came back to the house for more conversation. It had been a good visit. Kate participated more than she usually does. She was more animated than normal, sometimes more assertive as well. I’ll have to talk with Tom about his impressions, but I felt she handled herself well. She is changing, but she does far better in social situations than I would expect knowing how little memory she has. At one point, she asked Tom about Bruce, a mutual TCU friend and one of my former roommates. I was surprised she recalled his name. As usual, I knew that some of the things she said were figments of her imagination. They aren’t, however, the kind of things that provide an immediate alert to others that she is confused. She is having significantly greater trouble recalling names in the past couple of weeks. Today, she asked, “What is your name?” I find it hard to believe that she has forgotten, but that is what it sounded like when she asked the question. After I told her my name, I asked, “Now what is your daughter’s name?” She couldn’t answer. I said, “Jesse.” Then she immediately gave me Jesse’s middle name. Clearly, the first name triggered the middle name even though it is one we do not use. The changes in her memory make me think that making another trip to Texas in the spring and a trip to Asheville for our anniversary may not happen. If that is so, there are likely to be other changes on the horizon, and not as distant as I would like. I find that there are so many things going on in our lives that I don’t come close to writing about all of them. There are also events that I want to report but can’t do so at the time. Then later I forget them. One of these things occurred about ten days ago. Here’s the story. One of the topics I have mentioned on several occasions involves the conversations between Kate and me. I would have said more if there were more to say. The truth is that Alzheimer’s is hazardous to conversation. Normally one doesn’t think of it, but conversation is dependent on our memories, Much of that involves recent memories like things we have done, people we have seen, events in the news, and places we have been. Kate can’t remember any of these things. That means she relies on her distant past. For a good part of her journey, she has often spoken about her family and, especially, her mother. That has carried her in limited social encounters with friends or strangers. She has also done that with me, but we are together so much that the result is that she doesn’t talk much at all. We say very little wherever we are. As a talker, that has been a significant loss to me. She actually prefers that I minimize my talking. I suppose that makes it more comfortable for her. She doesn’t have to respond. A week ago this past Saturday, we drove to Nashville to visit Ann and Jeff Davis. Typically, we would spend the entire time in silence. This trip was a notable exception. We talked just over an hour of the two-and-a-half hour ride. During this time, we focused on things for which we are grateful. These included things like our marriage, our children and grandchildren, our parents, friends, things we have done, and places we have been. We kept the conversation at a more general level that didn’t require Kate to recall specific details. I loved having such a conversation and hearing her express her thoughts on all these topics. I am confident that Kate enjoyed it. I know I did. As an added bonus, it made the trip to Nashville seem a lot shorter than it really is. Everyday all of us find ourselves making choices to do one thing or another. We can’t do it all. It’s no different when one is caring for a person with dementia (PWD). The only difference is the caregiver always tryies to decide which of two or more alternatives is the best one for the PWD. I’ve had to make one of those decisions today and hit a home run. This afternoon the UT Opera Theater had an annual student recital. We have attended several of these in the past and enjoyed them immensely. The Live in HD at The Met production today was Tosca. We couldn’t do both; so I decided on Tosca. Although I am sure the recital was good, I believe I made the right decision. We’ve seen quite a few of these operas, and this was one of the best. Kate loved it. When she is really enthusiastic about a performance, she not only applauds but also says, “Wow.” I heard several of those today. I am a little sensitive about this because she is the only one in the audience that expresses anything audibly. While the opera itself was outstanding, it was even better to know that Kate was so enthusiastic about it. At the last of these operas last spring she wanted to leave after the first act. I don’t remember what opera that was. I do know that was the first one she has not enjoyed. I feared that our opera experiences might be nearing the end. It looks like we have a bit longer. This coming Friday, we are attending a performance of The Barber of Seville by a European opera company that comes to Knoxville periodically. In addition, there are several other Live in HD productions I would like to attend, including La Boheme and Cosi fan Tutte. After dinner tonight, we came back to the house and prepared for our normal relaxation time at the end of the day. I got Kate’s medications and put them on her bedside table along with a glass of water. Shortly, she came into the room and started to take her pills. She had only taken a couple when she must have turned around to do something else. Then she asked me if the remaining pills were for tonight or in the morning. This is something she has said on several evenings lately. Prior to this she simply assumed they were all the evening medications. Like many things, I can’t say what accounts for the change. 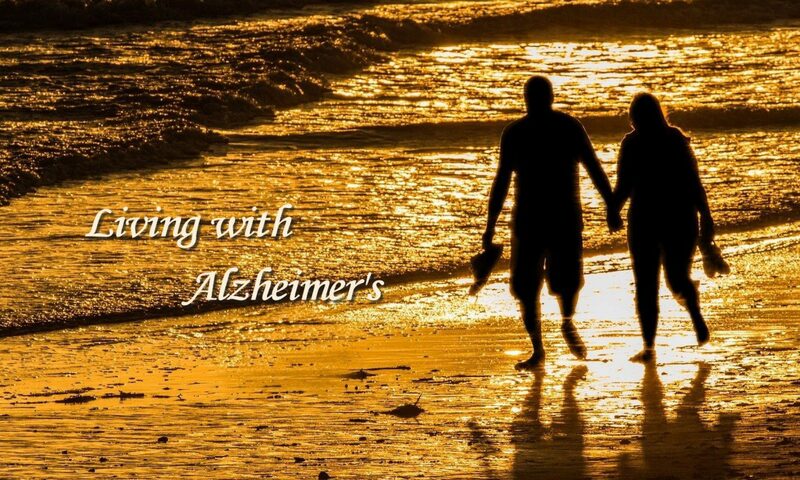 It is just among the variety of things that go along with Alzheimer’s. A little later, I got ready to take my shower when I heard her call, “Help.” It wasn’t a frantic call, but it was clear she needed something. I came out of the bathroom to see that she was struggling with her robe. It was inside-out, and her left arm was in the right sleeve. She couldn’t find the other sleeve. I got her straightened out and said, “Another case of teamwork. We work well together.” She thanked me and gave me a hug. It’s one more sign of her increasing dependence. Kate got up earlier this morning but late enough that we were a little short of time before meeting a group of friends at 11:00. We squeezed in just enough time for get Kate’s muffin. As she was eating, I reminded her that we were going to a birthday celebration today. As I had expected, she hadn’t remembered. I explained that this was a group of friends who had been faculty colleagues at the middle where she had been the media specialist for about ten years. Several of them had January birthdays and used to celebrate together. It had been five years since our last time together; so I had arranged for us to do it this year. Kate asked me to tell her who would be there. I went through each of the six other people besides ourselves. In a moment, she asked again. After that she said, “You might have to tell me again.” She then asked me how we knew these people. I reminded her of the school connection. Then she asked me to tell her who our children are. As she did the other day, it sounded like she really knew and just wanted to practice names. I told her their names. Then I proceeded to tell her the names of the grandchildren. After that she said, “Where are we right now?” I asked if she “meant this place.” She nodded, and I said, “Panera.” When we got in the car she asked, “Where are we?” I asked if she meant the city. She did, and I told her. As we neared the home of the couple hosting the event, she asked me the names if the people we would see. I told her and also told her I didn’t think she would have to worry about knowing each person’s name, that everyone would assume she knew them. I may be imputing too much, but she looked a little apprehensive as we arrived at the house. We were greeted by three people at the front door. From that point, everything went well. Kate’s gift for social interaction came to the rescue. I suspect that everyone was surprised at how well she seems to be doing. There was a lot of conversation before, during, and after the meal. Kate was not very talkative, but neither was I. Several of the others are big talkers, and there was a lot of reminiscing of experiences they had shared in their teaching careers. There were only two things that Kate said that would have been signs of her Alzheimer’s. The woman hosting us had prepared a spaghetti casserole that was a recipe of Kate’s mother’s. We talked briefly about that early in the meal. Fifteen or twenty minutes after that as we were talking about foods that we liked, Kate said, “I wish you could have had my mother’s spaghetti casserole.” I had informed everyone of Kate’s diagnosis before we got together; so they didn’t say anything to make her realize that was something we talked about before. The other thing was that Kate told them about a school at which she had taught. As she described it, I knew that she was talking about the school where each of them had taught together. I was a bit uncomfortable as she was talking because I knew that some of the things she said weren’t true. I am sure everyone realized that she was confused. What I will take away from this gathering is that Kate handled herself very well, and we both enjoyed ourselves. I still can’t escape the sense that she is changing significantly and hoping that she will be able to function well in social situations for a good while to come. Memory is fading, but she can still be light-hearted. At Panera this morning, Kate asked me the name of a young man who works there. I told her. Then she asked again. I told her again. A minute passed. She looked up at me and said his name. I said, “You got it.” She smiled and said, “Ask me again in five minutes.” She knows she is not likely to remember. As we walked away, Kate asked, “What’s her name?” When we got in the car, she asked, “Where are we?” I asked if she meant the city. She said, “Yes.” I told her. It is such an interesting contrast, appearing to get along so well and then forgetting people and places you might think she has the greatest likelihood of remembering. Shortly after returning from lunch today, I received a call from Inez Grayson. She is a friend of Kate’s and a former staff member at our church. They became friends when Kate was the church librarian. She had called me a couple of weeks ago to arrange a time when she could take Kate to lunch to celebrate her birthday. I was so pleased to hear how well the lunch had gone. I’m not surprised. She has always been very fond of Inez, but I always like to hear that she has gotten along well. It is another good illustration of how well she can function in social situations. I hope this continues for a long time. When Inez first called, she was happy to include me, but I thought it would be much better for just the two of them to have time together. I know that when I am around, I can dominate more than I should. I am so glad I wasn’t there. As she has done several times lately, Kate slept late. She opened her eyes when I walked into our bedroom about 8:30, but she didn’t get up until 10:30. That is after going to bed around 8:45 last night. Until recently, she had been going to bed between 8:00 and 8:30 and getting up around 9:00. It is quite possible that our recent trips to Texas have thrown her off a bit. On the other hand, I always wonder if she might be establishing a new pattern. This is a light day for us. The only commitment we have is to get haircuts at 3:00 this afternoon. Because we have plenty of unscheduled time, I decided to drop by Panera for Kate’s muffin even though it was 11:30. I thought it would be good for her to be occupied for an hour here before we go elsewhere for lunch. It’s a sunny day though a bit chilly. I suspect she may want to work in the yard a little between lunch and our haircuts. That will leave us with another hour and a half or so before having dinner. I find that the day seems to go well when Kate’s activity is divided into small “chunks” of no more than two hours. She is in a good mood today and is happily working her jigsaw puzzles on her iPad. She hasn’t asked me to help her once, and we’ve been here about fifty minutes. That is a rare event. I am optimistic we will have another good day. Not long after we sat down for lunch yesterday, Kate said, “Tell me my father’s name.” I gave her his full name. The she asked for her mother’s name. Once again, I gave her the full name. Unlike the other day, I believe she really knew the answers and also believed I knew them. I think she was just leading into a way to talk about the names of people and places she is beginning to forget. I asked her to tell me our daughter’s name. She got it as well as her husband’s name. She stumbled on her boys’ names, but when I said Ron, she immediately said Randy. We did the same with our son’s family. When I told her that Kevin and Rachel have three children, she looked surprised and said, “Three?” I gave her the names of all three. Following the family part of the name game, she asked, “Where are we right now?” I told her we were at Carla’s. It turned out she wanted to know what city we were in. I said, “We’re in the city where our home is located.” She said, “Where is that?” I told her and didn’t go any further. Even though I know her memory is fading, I find myself surprised when I come face to face with examples like this. I wish it weren’t so. Later in the afternoon, we spent some time at Barnes & Noble. Before leaving, she wanted to use the restroom. It is located about 60-70 feet and to the right of where we were sitting. She asked me to tell her where it is. I suggested that I take her. At first, she didn’t want me to. Then she quickly changed her mind. She went ahead of me and I took a seat on a bench directly across from the women’s room 15 feet away. I saw her walking back toward me. She said she couldn’t find it. I showed her the door a few feet behind her. She had walked by it twice without seeing it. These things confirm what I already know, that I need to stay close to her even in places like this where we are a closed space. It would be even worse in a mall or the Atlanta Airport where I lost her for 35 minutes on our recent trip to Texas.